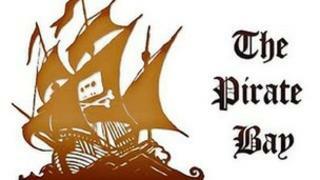 BT has joined other UK internet service providers (ISPs) in blocking access to The Pirate Bay (TPB), a ban the group says users have already circumvented. TalkTalk, Sky, Virgin, O2 and Everything Everywhere have already cut off access to the site, which hosts links to pirated music and video. The High Court ordered ISPs to prevent users visiting the site in April. However, TPB new IP (internet protocol) addresses became active on Tuesday following BT's action. BT customers attempting to access the site via its original web address receive the message: "Error - site blocked". However, the Torrent Freak news site reported that if subscribers used either of the two new IP addresses they would still be able to access the TPB's pages. It added that a "Pirate Bay insider" had told it that the site was willing to continue adding new addresses "for years to come". BT had cut off access to other alternative addresses, known as proxy sites, previously made available by TPB. But a representative of the UK Pirate Party - a political group that opposes the bans - told BBC News that more proxy sites had been made available "within minutes" of BT's move. About 10% of traffic to its proxy sites now seemed to be coming from BT customers, 30% from Virgin Media customers, 15% via Sky, 6% via TalkTalk and 3% via O2, he said. BT declined to comment on reports the block had been circumvented. The Pirate Party spokesman said public interest in the service following the ban had also boosted traffic to the party's website. "This increased traffic isn't just about The Pirate Bay; it seems that the proxy has sparked an interest in the Pirate Party itself, and we are seeing a significant uptick in membership and people navigating the rest of the site," he said. "The volume of emails and phone calls into the party has also increased markedly." The spokesman added: "Blocks on Pirate Bay have effectively short-circuited the democratic process. "Our internet policy is not being run by our elected representatives, it is being dictated by the music industry."